Chemists hoping to copy the way ocean-going organisms build intricate silica nanostructures have developed effective new mimics of two key biomolecules. Marine organisms such as sponges and diatoms make their silica skeletons by concentrating the low amounts of silicon found in seawater. 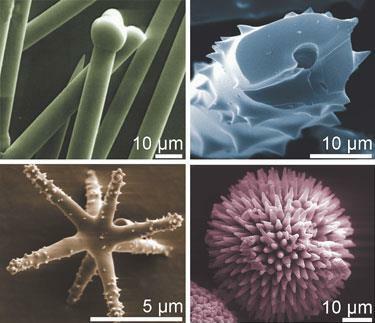 By polymerising silicic acid, [Si(OH)4], into chains of alternating silicon and oxygen atoms, diatoms make complex silica exoskeltons, while sponges make spike-like ’spicule’ structures that can reach three meters in length, while just 10 millimetres across. Scientists are attempting to understand these biological processes, with the additional aim of copying nature’s ability to make complex silica structures under mild conditions from seawater. In comparison, the current industrial silica-making process is energy-intensive, and provides relatively little structural control. Industrial silica - a ?1.4 billion industry - is used in a wide variety of products, from construction fillers to toothpaste, but greater control over the material’s nanostructure could lead to a host of new applications, from porous supports for catalysts to drug delivery vehicles. While the exact mechanisms by which diatoms and sponges make silica structures is still only partly understood, a number of biomolecules have been implicated in the process. Carole Perry at Nottingham Trent University, UK, and colleagues have made synthetic analogues of molecules used by diatoms to construct their silica exoskeleton. Meanwhile, analogues of the enzyme sponges use to make their skeleton have been developed by James Naismith at the University of Strathclyde, Christopher van der Walle at the University of St Andrews, UK, and colleagues. Sponges that make silica spicules evolved 700 to 800 million years ago, and template the growth of these spikes via and enzyme called silicatein. This enzyme is difficult to produce in large quantities, says van der Walle - but is structurally related to a human enzyme, cathepsin L, which is easier to make. The team made a hybrid enzyme, based on cathepsin L but incorporating key features of silicatein, and showed it was an effective silica catalyst. Diatoms - microscopic photoplankton - emerged much later than sponges, around 300 million years ago, and use polyamine-based structures to make their silica shell, including polypeptides called silafins which have polyamine sidechains. Polyamine-based molecules have also recently been isolated from silica-forming sponges. Perry and colleagues have shown that certain commercially available polyamides, in which each amine is linked by a two-carbon chain, can perform as well as the natural structures which incorporate three-carbon chains. However, Werner M?ller, who studies biosilification at Mainz University, Germany, points to the silicic acid pumps identified in both diatoms and sponges, which could be accumulating silicic acid from water to supersaturated levels, before proteins such as silicatein and silaffins template silica growth into intricate nanostructures. M?ller suggests that, at the current rate of research, he could be making artificial spicules from seawater in just two years from now.